There’s some good news and some bad news in the Congressional Budget Office’s new budget outlook. While the $467.5 billion deficit projection for fiscal 2015 is the lowest since 2007, the nonpartisan agency predicts higher deficits in the years to come. As it stands, this year’s deficit is equivalent to 2.6% of U.S. gross domestic product and contributes to the public debt of $12.97 trillion and counting. The public’s concerns about reducing the deficit have varied over the past two decades, according to the Pew Research Center’s annual policy priorities surveys. At the start of the Obama administration in 2009 – with that year’s debt ($1.4 trillion) at nearly 10% of GDP – just 53% of the public said reducing the budget deficit should be a top priority for Congress and the president. But the share citing deficit reduction as a top priority spiked to 72% in 2013 before dropping to 64% in a survey earlier this month. Terrorism (76%) and the economy (75%) are the public’s top concerns of 2015. 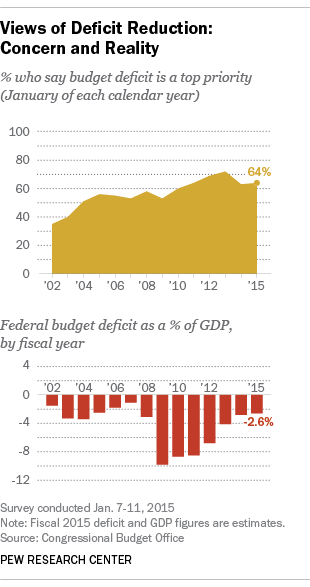 Concern over the budget deficit hit a low point in 2002, a few months after the 9/11 attacks. In January 2002, just 35% rated deficit reduction as a top policy priority, less than half the percentage citing defense against terrorism (83%). At that time, many domestic policy objectives fell in importance in the aftermath of the terrorist attacks. Partisanship has long been a factor in views of the importance of reducing the budget deficit. Historically, respondents of the “out” party – that party not in control of the White House – tend to view the deficit as a higher priority than those who share the president’s party. Currently, 55% of Democrats say reducing the budget deficit should be a top priority, compared with 72% of Republicans. The reverse was true at the start of George W. Bush’s second term: 64% of Democrats, but 48% of Republicans, said the deficit was a top priority in 2005. 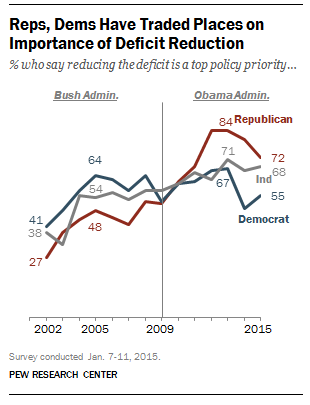 Deficit reduction has declined in importance among members of both parties over the past two years. In January 2013, 84% of Republicans cited the deficit as a top priority, 12 points higher than today, as did 67% of Democrats (also 12 points higher). Even as the deficit has fallen in recent years, the public has expressed skepticism that progress has been achieved. In December 2013 – when the deficit was shrinking relative to GDP – just 29% said that the country had made progress in reducing the deficit over the past year; more than twice as many (66%) said the country had not made progress. Just 12% of Republicans and half of Democrats (50%) said the country had made progress on the deficit.